Law of Attraction Trainer Certification! This course is for anyone looking to become a LAW OF ATTRACTION TRAINER, to the level at which you can train others to become LOA Practitioner. Even if you are a beginner with no prior success with harnessing the Law of Attraction or perhaps are not interested in using the material to teach others, you should still take this course. You will learn everything you';ve ever wanted to know about Advanced Law of Attraction techniques and how to harness it';s power to completely transform your life and the lives of others. In the professional arena, this course will take you to the TRAINER level and position yourself to have people pay you for your knowledge and expertise. Q. 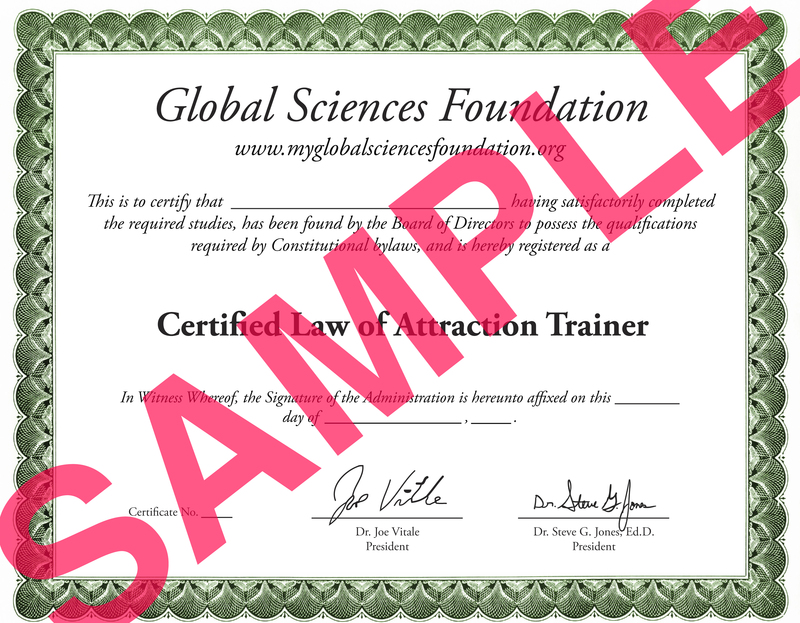 Will I be properly trained if all I take is your online Law of Attraction Trainer Certification program? A: Ideally a Law Of Attraction Trainer would be trained in a classroom setting with an instructor physically present. Unfortunately, this luxury is not practical for many people. When we factor in airfare, hotel, time away from work and family, etc. the costs both monetary and otherwise quickly add up. For this reason, many institutions have turned to online training as a viable alternative to meeting modern day needs. In fact, Columbia, Harvard, and Cornell have extensive online programs. Also, Penn, Dartmouth, and Yale offer online classes. Dr. Steve G. Jones, while working on his doctorate in education, extensively studied the online programs offered by Ivy League schools. He then was able to take what he learned from the curriculum and combine it with Dr. Joe Vitale's adept knowledge on the Law of Attraction to create the Law of Attraction Trainer Certification Course that offers the highest level of training. Additionally, in this course, you are encouraged to find a study partner and to practice your techniques on a number of people. Q: What about licensing requirements for Law of Attraction Trainers. Are there any? A: At this time, to the best of our knowledge, there are no licensing requirements For Law of Attraction Trainers anywhere in the World. However, if you start a business, you will generally need a business license. A Law of Attraction Trainer qualified by our standards to train others to become Law of Attraction Practitioners, Master Practitioners and Trainers. A: You get instant access to all 5 training manuals (approximately 30 pages each) and a Marketing Guide eBook to help you set up your practice. A: Upon completion of this program, you will receive a beautiful certificate sent via email, which you can print out and proudly display for your clients and students to see. It will have your name, title (Certified Law of Attraction Trainer), and your certification number. A: Yes. 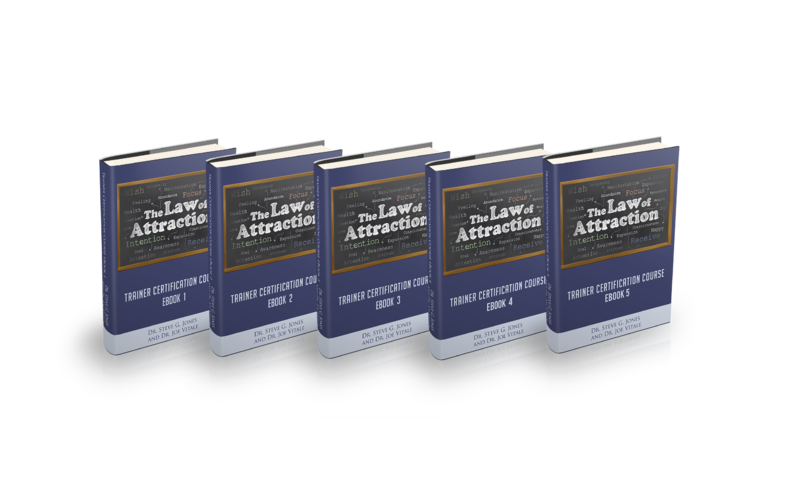 You will be listed on the international online list of Law of AttractionTrainers. Q: I am a layman with no Law of Attraction background. Will this program actually take me from the ground floor up and teach me everything I need to become a Law of Attraction Trainer? A: Yes. 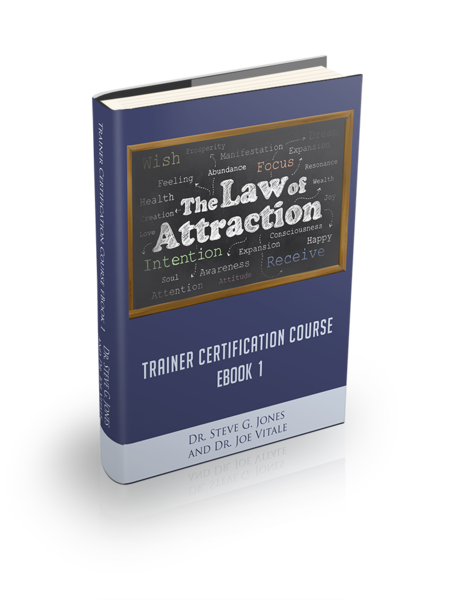 This program is extremely thorough and it will teach you everything you need to know to be a certified Law of Attraction Trainer. We encourage you to take every level of Law of Attraction course that we offer to fully prepare you as a Law of Attraction Trainer. A: This home based course, is designed to be a resource for you for the rest of your life, to teach you Trainer-level Law of Attraction techniques and how to effectively use it to your advantage. You will learn valuable tools for harnessing the power of the Law of Attraction as well as unique tools for life in this intensive, power-packed course. With the online training program you can study at your own pace and you are not tied to a specific training schedule. If the Law of Attraction enables rapid positive change, why not learn rapidly? Have fun, expand your awareness, and experience deep positive change on extremely rapid levels. Examining Excellence Models, Find Exemplars, Create the Modeling Narrative, Narrative and Visualization Guidelines, Forging a New Path, Discipline is Key, Identity and Reframing, Becoming an Effective Mentor, Role specificity, Supportiveness, Learning Together, Encouraging Progress, The Magic of Storytelling, Boost that Introduction, Develop the Conflict, Derive from Various Sources, Appeal to the Senses, Actionable Message, Helping Students Attain Inner Solitude, The Abundance Master Code, Scarce City, A Resilient Mood, Immerse and Indulge, The Art of Gratitude and Finding the Good, The Creator Persona, Reaffirming Abundance, Evaluation Parameters, The Idea Train, The Emotion Soup, Core Philosophy of the Law of Attraction, The Crumbling Illusion, Opening the Mind's Door, Desiring the "Impossible," The Dichotomy of Inner Life and Outer Life, Painting with Emotions, An Individual's Power, Channeling More/Less, Rewriting the Story, Attracting Success, Unfiltered Emotions, The Lack Factor, Faulty Intension-Setting, Becoming an Abundant Person, Reorienting Life Experiences, Finding Genuine Happiness. Discusses the NLP modeling technique or how to create actionable behavioral templates for personal excellence. Includes sections on finding exemplars and creating a working narrative for chosen models. Focuses on developing the trainer's skill in teaching. Discusses storytelling techniques to improve discussions with mentees. Asking for Abundance from the Universe. Explores advanced facets of abundance and how to maximize manifestations of abundance. Also teaches a trainer how to evaluate emotions and beliefs. All about philosophical aspects of the law of attraction. Zeroes in on perception, belief, the power of memories and experiences. Discusses how one can rewrite a life narrative, shifting from past/future to present. Includes additional reviews on abundance and taking inspired action.